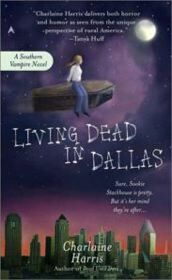 In the second book of Charlaine Harris’ Sookie Stackhouse series, Living Dead in Dallas, Sookie finds herself getting more and more involved in the vamps’ world. Was it Michael Corleone who said, “Just when I thought I was out, they pull me back in?” That should be Sookie’s motto because even though she knows better than to get mixed up with vampires, she always seems to anyway. This time it’s after she’s attacked by a maenad that she ends up owing Eric a favor. He wants her to go to Dallas to find out who’s been kidnapping vampires. The prime suspect is the Fellowship of the Sun, a sketchy group that masquerades as a religious organization. Sookie also has to investigate the unrelated murder of a friend in Bon Temps. I’m reading and reviewing all the books for the Sookie Stackhouse Reading Challenge, but I’ve been procrastinating on writing this review. Living Dead in Dallas isn’t my favorite in the series, but I’ve read further so I know that I like the third book much better. I fell in love with Bon Temps when reading the first book, so it seemed strange that so much of this book was set in Dallas. I also wasn’t crazy about the separate murder plotline that just seemed completely random. Of course, I still love Sookie’s sass and unique perspective, so there’s a lot here to like. Eric also has a large role in this book, which, in my opinion, is always a good thing. I have to say that I enjoyed the second season of True Blood, which was based on this book, more than the book itself. The show changed around the maenad storyline and fleshed out some of the minor characters, and the result was a very entertaining story. If you’re a fan of the show who wants to read Living Dead in Dallas, I’m going to warn you right now that the two are very different. If you’re like me and aren’t crazy about this book, keep reading – the next one, Club Dead, is worth it.